The race season is now over and clubs and tracks are having their awards banquets. Ours was at The Millhome Supper Club. It was fun to see our karting friends again. 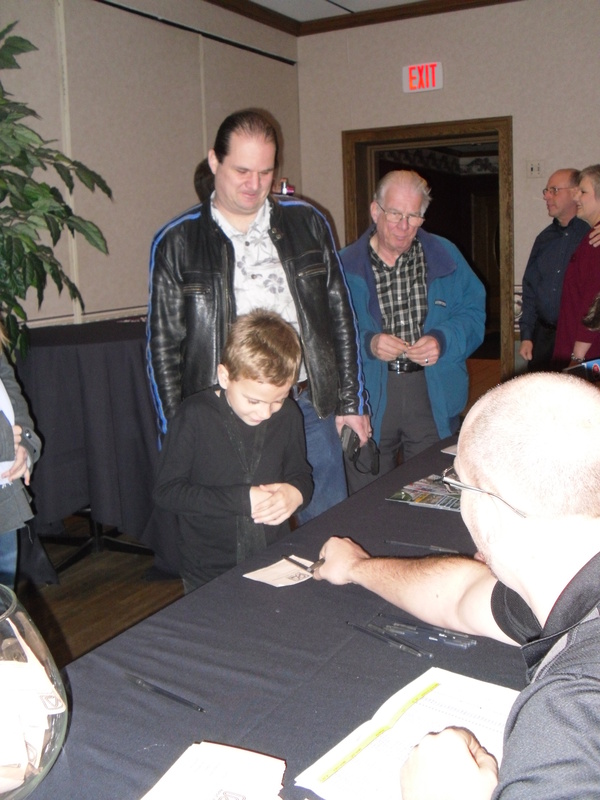 Jason spent most of his time either watching some other kids play a NASCAR video game, ogling the door prizes including a brand new Briggs Animal motor, and chatting with his kart buddies. He got a his own chance to play the NASCAR game, he did pretty well for his first time. It never hurts to dream big. The club did a great job with pictures (1, 2, 3, 4) of the season. Almost every kid kart was on the screen at some point in the evening. There were lots of great pictures of some of the race winners and action shots. I really liked to see the tired smiles of victory. Congratulations to all of this years class winners. Getting his Kid Kart award from Mike Kertscher. Note the tie, he wore it to school too. Jason was very excited to get his trophy, but dreams of actually earning some of the big metal. “I like all the trophies I got this season but would rather earn them”. He very much understands that trophies and hopefully things worthwhile in life are earned, and you need to work to earn them. He and Logan were very excited for the door prizes. After we watched and clapped enthusiastically this year’s winners as they receive their well-earned trophies, the door prize drawings started. Jason really wanted the new Animal motor that was given away first. Unfortunately his name was not pulled until late, so pickings were slim. But he did end up with some pretty cool Road America clothing that where just his size. I was able to trade a coupon for Streeter for some Briggs animal clothing and stickers from one of the 2 cycle racers. He wants the small sticker on the truck and the giant 12 inch stick on the basement fridge. The animal shirt is an XL and should make an excellent night shirt for him. 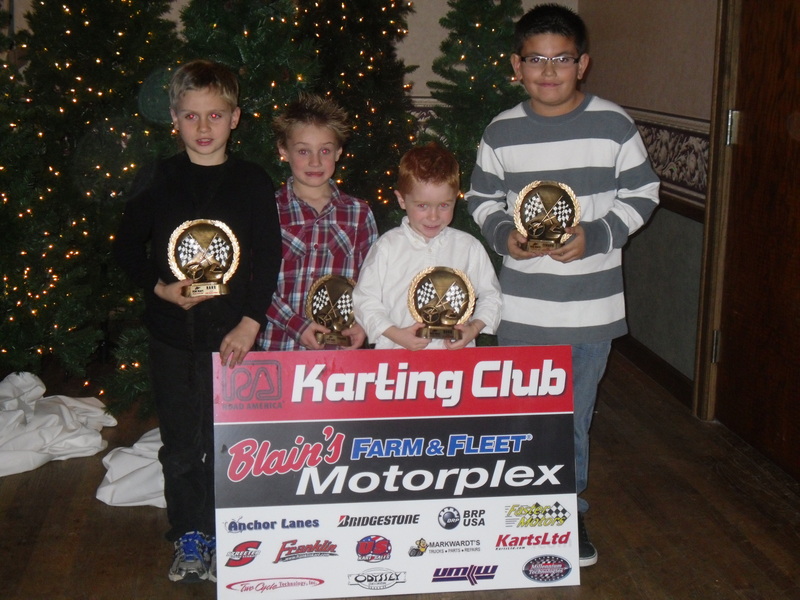 Jason, Logan, Emery, and Mason with their kid kart trophies. It was a great last memory of the season. I wish we could have seen Easton and Bryce and their support team and family but they had other plans. We are looking forward to what next season brings and will keep posting updates as we make progress on the new kart and where we will be racing next year. Thanks to RAKC for the great season and teaching us about this great sport. The Millhome Supper Club for serving a great meal. To my Dad for joining us and lending us his car. Hey Karen, I should have the kart out of the basement by March maybe February, thanks. Bonus video from the oval race. I like the way Easton gets the lead and Jason falls in right behind him back. I was hoping that I had the on board video for this we we could see them side by side, but alas I forgot to turn the camera on.